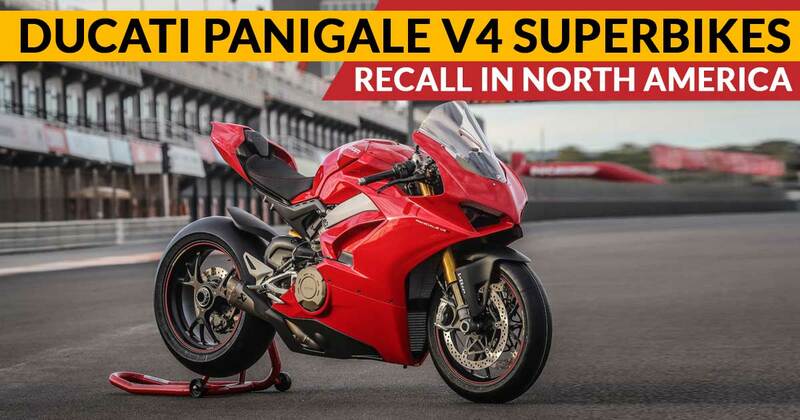 Ducati Panigale V4 Superbikes recalled in North America over an oil cooler issue. A total count of 1,663 units is reported being affected with this faulty equipment. The company is set to start a campaign to resolve the issue on 24 January 2019, in which the customers will be contacted. If the vehicle found affected the dealers will replace the faulty oil coolers free of cost. Aware to safeguard its clientele, Ducati released an official statement which says there is a possibility that the output of the oil cooler gets cracked owing to aggressive riding for a long run. Resulting, oil leak around the radiator. The listed models' possibility affected by the glitch in Panigale V4 Superbikes series are the standard Panigale V4, V4 S and V4 S Speciale. The Ducati Panigale V4 is a substitute for the 1299 Panigale superbike in brand’s lineup. Instead of an earlier V-twin motor on the 1299 Panigale, the V4 boasts a 1,103cc, liquid-cooled, four-cylinder engine rated to develop monstrous power of 211bhp and 124Nm of peak torque. Sits on a fully-adjustable USD fork up front from Showa and a rear monoshock, the V4 is armed with 330mm dual discs up front and a 245mm disc at the rear for braking specs. In India, the Panigale V4 that is on sale at INR 20.53 lakhs (ex-showroom), not announced for such recall over faulty oil cooler issue. In the country, the bike in question seeks competition with the rivals in the segment including the Aprilia RSV4 RR, Suzuki GSX-R1000, Yamaha YZF-R1, BMW S1000RR and the Honda CBR1000RR.